On June 15th, the Cheech and Chong: Get It Legal tour is coming to The Venue at the Horseshoe Casino in Hammond, Indiana. Tickets go on sale Wednesday, February 27th at 10am local time via the Ticketmaster link above. The tickets are approximately half the price of their Count Basie show in New Jersey. Big price difference. 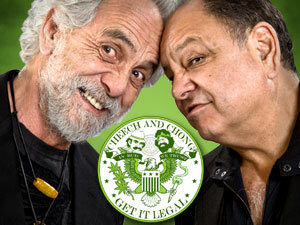 On May 1st, the Cheech and Chong: Get It Legal tour is coming to the Count Basie Theatre in Red Bank, New Jersey. Tickets go on sale today at noon via the Count Basie web site. High Times' unofficial mascot, Tommy Chong, received the 2013 Lifetime Achievement Award, this past weekend at the Cannabis Cup in San Bernardino, California.